You will feel like you are living the life of luxury in many restaurants in Canada but “Alo” is a place that has really done themselves proud as of recent. The Toronto establishment has been included in a list of most prestigious restaurants in the world at a respectable number 94. It’s good enough to be top in Canada but to be known around the world as a place worth eating is really something else. This is a French restaurant with a cocktail bar and is very popular, even more so since this nod of approval. 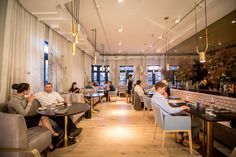 There are two distinctive dining experiences at Alo which make them stand out from other restaurants; this includes “the dining room” and “the kitchen counter”. All meals served here are absolutely delicious, with the best ingredients and such love and care gone into the presentation of what will be brought to your table. The people who actually put Alo proudly on this list actually went on to describe the restaurant as a champion of fining dining, using amazing techniques to provide a thoroughly enjoyable experience for all guests. This is pretty high praised indeed and reviews from customers online reflect these options, with many hailing Alo as the best restaurant they’ve ever been to. The head chef of this restaurant is called Patrick Kriss and he was actually trained by the best in the world. Him and his talented team behind him ensure that the food is amazing, the service is brilliant and you have a thoroughly memorable experience at the restaurant that you will want to return again and again. If you want to eat at Alo just so you can see what all the fuss is about, it’s recommended that you book a table because it’s always jam-packed with foodies from around the world.